160 Beacon is located on the north side of Beacon, between Berkeley and Clarendon, with 154 Beacon to the east and 164 Beacon to the west. 160 Beacon was designed by architects Peabody and Stearns and built in 1902 by McNeil Brothers for banker and broker John Parkinson. It replaced two houses, at 156 and 158 Beacon, which he purchased in November of 1901 and had razed. Click here for an index to the deeds for 160 Beacon. John Parkinson is shown as the owner of 160 Beacon on the original building permit application, dated December 24, 1901. The address is shown as 162 Beacon on the application. Plans for the house are included in the Peabody and Stearns Collection in the Boston Public Library’s Arts Department (reference PS/MA.119). The plans include front and rear elevations, a lateral section, floor and roof plans, framing plans, and drawings of interior details. Click here to view the original plans for 160 Beacon. By the 1902-1903 winter season, John Parkinson and his wife, Gertrude (Weld) Parkinson, had made 160 Beacon their home. They previously had lived at 238 Marlborough. They also maintained a home in Bourne. Gertrude Parkinson died in June of 1904. John Parkinson continued to live at 160 Beacon with their son, John, Jr., who was a stockbroker in his father’s firm. John Parkinson, Jr., married in June of 1905 to Mary Ann Wales Emmons. 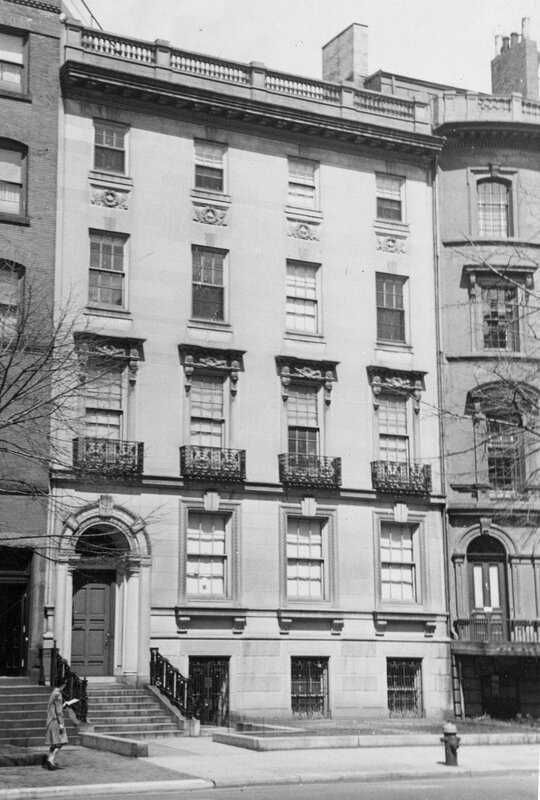 After their marriage, they lived with his father at 160 Beacon and also maintained a home in Dover. John Parkinson, Sr., died in October of 1918. After his death, John and Mary Ann Parkinson continued to live at 160 Beacon during the 1920-1921 winter season, after which they made Dover their year-round home. On March 31, 1920, 160 Beacon was purchased from John Parkinson, Jr., by Grant Walker, an investor in and director of various textile mills and related businesses. During the 1919-1920 winter season, he and his wife, Mabel (Shaw) Walker, lived at 448 Beacon, having previously lived at 330 Beacon. He died in April of 1920, a few days after buying 160 Beacon, and Mabel Walker moved back to 330 Beacon for the 1920-1921 winter season. By the 1921-1922 winter season, Mabel Walker had made 160 Beacon her home. She also maintained a home in Lenox. She continued to live at 160 Beacon and in Lenox until her death in May of 1943. On August 30, 1943, 160 Beacon was acquired from Mabel Walker’s estate by Willis Munro. Willis Munro was an attorney by training. He had given up law practice to become a forester, but later resumed practice as a trustee. He lived in Mattapoisett until about 1950, when he moved to 146 Beacon, which he had acquired in 1942. 160 Beacon was shown as vacant in the 1944-1946 City Directories. By 1946, 160 Beacon had been leased by Boston University. In August of 1946, it applied for (and subsequently received) permission to convert the property from a residence to a nursing school and dormitory. The school remained there until about 1949. From about 1950, to about 1952, 160 Beacon was the location of Fisher School for Men (formerly Fisher Business School and later to be Fisher College). 160 Beacon was shown as vacant in the 1953 and 1954 City Directories. On December 17, 1954, 160 Beacon was acquired from Willis Munro by Burdett College. It continued to be located there until the early 1970s. In June of 1972, it merged with the Bradford School Corporation. On September 11, 1972, 160 Beacon was acquired from the Bradford School Corporation by Nick S. Ferren. In June of 1973, he applied for (and subsequently received) permission to convert the property into eight apartments. 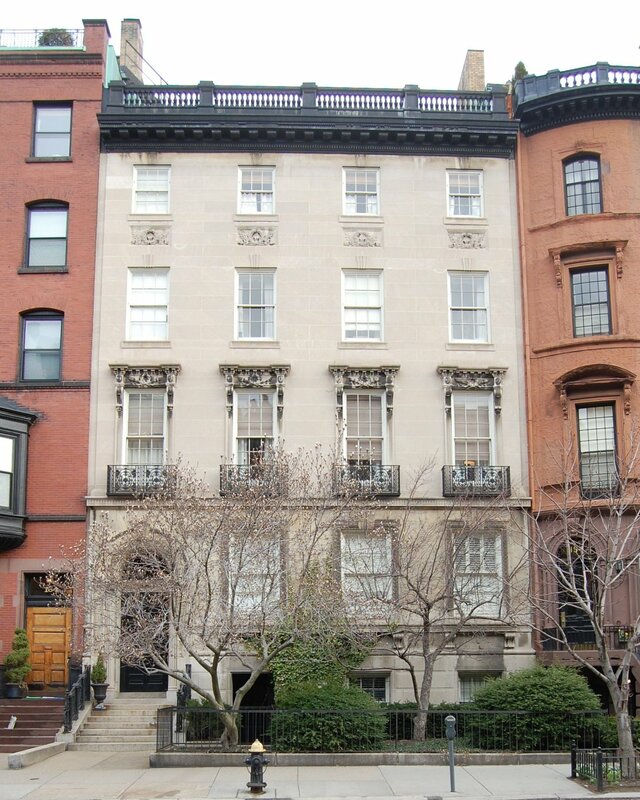 On March 6, 1975, Nick Ferren converted the property into eight condominium units, the 160 Beacon Street Condominium. 156 Beacon was designed by architect Charles K. Kirby and built ca. 1861, one of two contiguous houses (156-158 Beacon) of the same design. 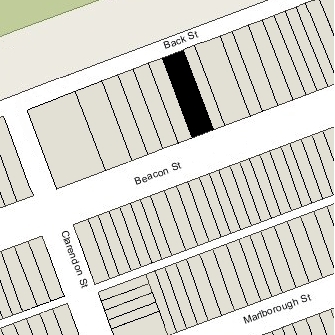 Charles Kirby purchased the land for 156-158 Beacon on January 18, 1860, from the Boston and Roxbury Mill Corporation. Click here for an index to the deeds for 156 Beacon (Demolished). On July 20, 1861, 156 Beacon was purchased from Charles Kirby by Caroline Maria (Welch) Crowninshield, the widow of Edward Augustus Crowninshield. She previously had lived at 103 Pinckney. At about the same time, 158 Beacon became the home of Edward Crowninshield’s brother-in-law and sister, Rev. William Mountford and Elizabeth (Crowninshield) Mountford. Caroline Crowninshield’s three sons – Edward Augustus Crowninshield, Jr., Francis Welch Crowninshield, and Frederic Crowninshield – also lived at 156 Beacon. Edward A. Crowninshield, Jr., had graduated from Harvard in 1861 and become a commission merchant. He died in July of 1867. Frederic Crowninshield graduated from Harvard in 1866 and married in October of 1867 to Helen Suzette Fairbanks. An artist, he subsequently studied in Europe, returning to Boston to become a teacher of drawing and painting at the Museum of Fine Arts in Boston from 1879 to 1885. In the late 1860s, Caroline Crowninshield was living elsewhere. In 1868, 156 Beacon was the home of wholesale dry goods merchant John Hogg and his wife, Emma E. (Whiting) Hogg. They previously had lived at the Parker House hotel. By 1869, they had moved to 50 Commonwealth. In 1869, 156 Beacon was the home of John Revere and his wife, Susan Tilden (Torrey) Revere. They previously had lived at 93 Beacon. John Revere was agent for, and later treasurer and then president of, his family’s firm, the Revere Copper Company. By 1870, they had moved to 40 Commonwealth. In December of 1869, Caroline Crowninshield married again, to attorney Howard Payson Arnold. The Arnolds lived at 156 Beacon after their marriage, occasionally making it available to others while they were traveling or living elsewhere. In 1875, it was the home of banker Richard Tucker Parker and his wife, Martha Sylvester (Thorndike) Parker. By 1876, they had moved to 85 Beacon. In 1876, 156 Beacon was the home of shipping merchant and woolen textile manufacturer Thomas Quincy Browne and his wife, Juliet Frances (Wheildon) Browne. They previously had lived in Concord. By 1877, the Brownes had moved to 190 Beacon and the Arnolds were living at 156 Beacon once again. 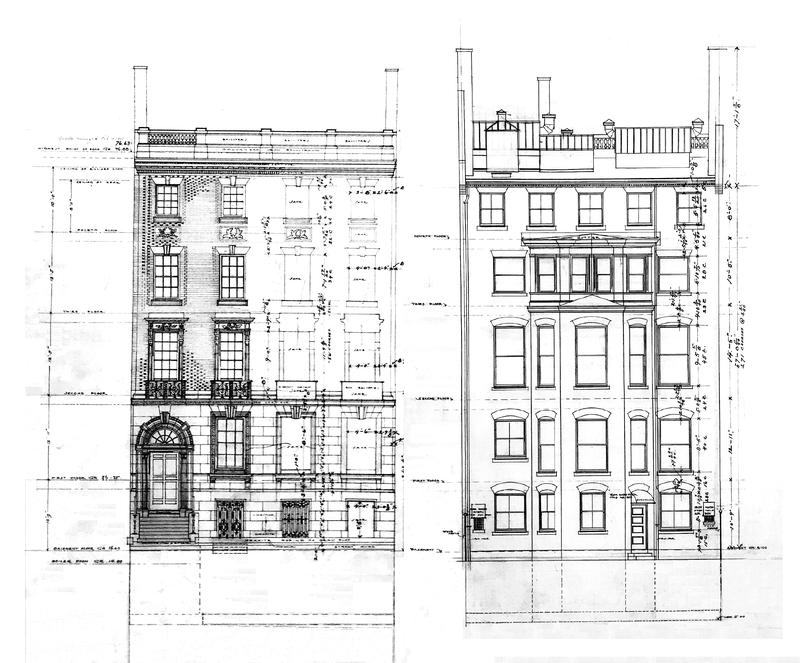 In 1882, the Arnolds were joined at 156 Beacon by Caroline Arnold’s son and daughter-in-law, Frederic Crowninshield and Helen (Fairbanks) Crowninshield. They had lived at 108 Marlborough during the 1880-1881 winter season, and moved to 95 Mt. Vernon by 1883. 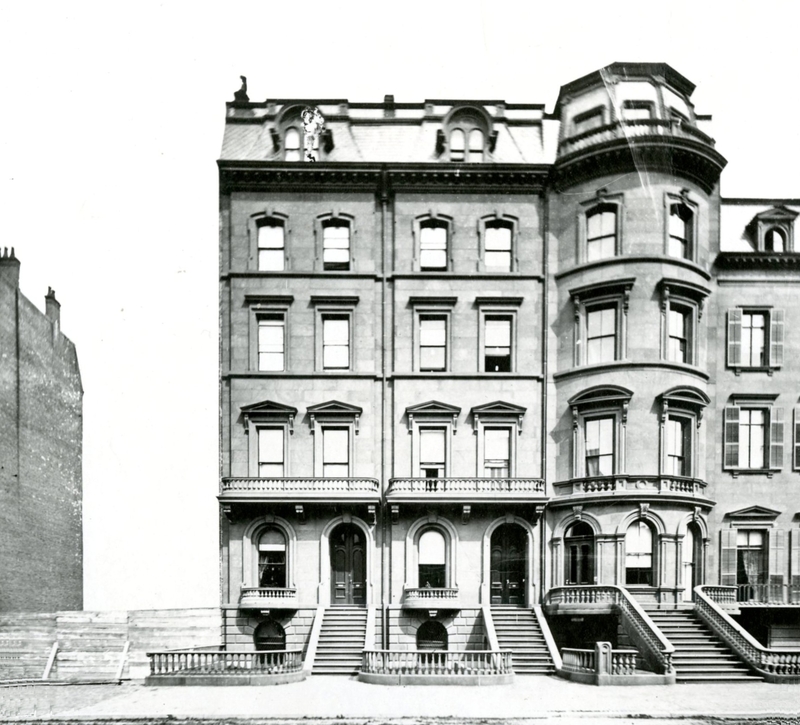 The Arnolds continued to live at 156 Beacon during the 1883-1884 winter seasons, but during the 1884-1885 season, it was the home of attorney and mining investor Horatio Ripley Bigelow and his wife Anne Lenthal (Smith) Bigelow. They had lived at the Hotel Vendôme the previous season. They also maintained a home in Hanover. They had moved to 9 Fairfield by the next season. By mid-1885, 156 Beacon was the Arnolds’ home once again. Caroline Arnold died in October of 1897. Howard Arnold continued to live at 156 Beacon until about 1901, but moved to Pasadena, California, soon thereafter. On November 4, 1901, 156 Beacon was purchased from Caroline Arnold’s estate by John Parkinson and was razed soon thereafter. 158 Beacon was designed by architect Charles K. Kirby and built ca. 1861, one of two contiguous houses (156-158 Beacon) of the same design. Click here for an index to the deeds for 158 Beacon (Demolished). On May 18, 1861, 158 Beacon was purchased from Charles Kirby by George H. Rogers, trustee for Elizabeth Boardman (Crowninshield) Mountford, the wife of Rev. William Mountford. They previously had lived at 72 Beacon. At about the same time, Elizabeth Montford’s sister-in-law, Caroline Maria (Welch) Crowninshield, the widow of Edward Augustus Crowninshield, purchased 156 Beacon. The Mountfords continued to live at 158 Beacon in 1863, but moved thereafter to 101 Beacon. On October 28, 1863, 158 Beacon was purchased from Elizabeth Mountford’s trust by wine merchant Edwin Augustus Boardman. He and his wife, Mary Ann (Dorr) Boardman, made it their home. They previously had lived at 57 Chestnut. Edwin Boardman died in April of 1868. Mary Boardman continued to live at 158 Beacon with their son, Edwin Boardman, Jr.. who continued to operate his father’s wine business. Edwin Boardman, Jr., married in June of 1875 to Harriet (Harriette) Smith DeBlois. After their marriage, they lived at 158 Beacon with his mother. They also maintained a home in Beverly. Mary Boardman died in 1889. Edwin and Harriet Boardman continued to live at 158 Beacon until his death in June of 1899. The house was not listed in the 1900 Blue Book. During the 1900-1901 winter season, 158 Beacon was the home of Joseph Warren Merrill, Jr., and his wife, Marian Louise (Raymond) Merrill. Joseph Merrill was a trustee of estates. They usual residence was in Manchester. On November 4, 1901, 158 Beacon was purchased from Edwin Boardman’s heirs by John Parkinson and was razed soon thereafter.